Gov. Bobby Jindal today said Americans are clamoring for a “hostile takeover” of Washington, D.C. While speaking at The Heritage Foundation to a group of reporters about his new energy plan, the Louisiana governor and potential 2016 presidential candidate said voters are calling on Republicans to offer “real ideas” and “real solutions” in Washington. That means not just talking about repealing Obamacare, Jindal continued, but taking measures to repeal and replace it. 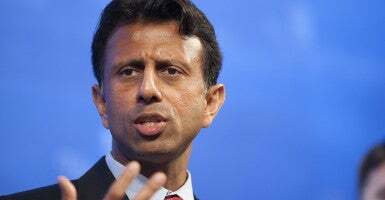 When asked by a reporter whether he plans to run for president in 2016, Jindal said he is “absolutely thinking and praying” about it, but for now, is focused the November midterm elections. Jindal, who became governor in 2008 after two terms in Congress, has presided over a state still recovering from Hurricane Katrina and the 2010 oil spill. He created the group America Next to be devoted to public policy; it released his 48-page energy plan Tuesday. Looking to the future, Jindal said this emphasis on policy solutions would benefit Republicans. He also presented it as a contrast with Obama.